If you’ve witnessed or experienced a traumatic, life-threatening event, situation or circumstance, you could be at risk of developing post-traumatic stress disorder (PTSD). Left untreated, this common disorder can impact all aspects of your life, affecting your mental, physical and emotional well-being. According to the Sidran Institute, an international nonprofit organization dedicated to supporting people suffering from PTSD and other trauma-associated disorders, an estimated 13 million American adults currently have PTSD. Statistically, women are twice as likely as men to develop the condition. In the past, experts thought that PTSD was a “psychological condition of combat veterans,” but it’s now known that anyone can be impacted by this common anxiety disorder. The good news is that awareness around PTSD has increased in recent years, leading to the development of treatments that are safe, effective and non-invasive. Psychotherapy, often referred to simply as talk therapy, is currently the most widely used PTSD treatment option in the United States. This involves working directly with a therapist to review the traumatic event or memories in order to help you process the experience in a safe, healthy way. 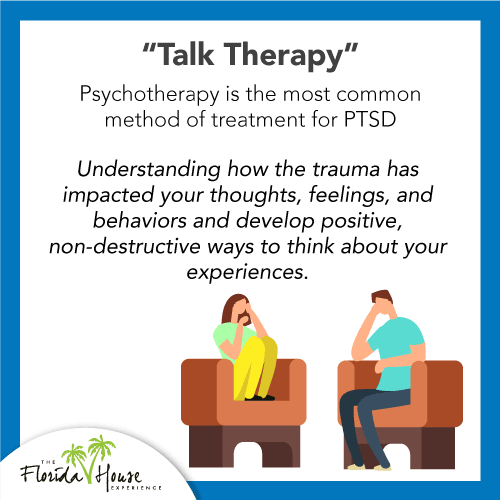 While thinking about the exact situation that triggered the uncomfortable symptoms can be difficult, the goal of PTSD psychotherapy is to shift the negative, reactive thought patterns you have in relation to the trauma. To do this, you need to understand how the trauma has impacted your thoughts, feelings, and behaviors and develop positive, non-destructive ways to think about your experiences. The Anxiety and Depression Association of America reports that cognitive behavior therapy, or CBT, is a type of talk therapy that has been shown to be highly effective in the treatment of PTSD. With CBT, your therapist focuses directly on the traumatic event or events, helping you to examine why the trauma happened and the impact that it’s had on your beliefs. In many situations, people who are suffering from PTSD develop persistent, inaccurate thoughts or beliefs that dramatically change the way they function in their relationships, deal with everyday stress and make decisions. CBT sessions are designed to give you the skills you need to accurately identify the vicious cycle of negative thoughts and fears by discussing your trauma with your therapist. You may also be asked to keep a journal to record your experiences with therapy sessions and help you track your progress. You’ll work with your therapist to develop healthier ways to think about your traumatic experiences and learn skills to minimize the negative impact trauma memories have on your everyday life. While the idea of reliving a traumatic experience might seem impossible when you’re suffering from PTSD, some types of cognitive behavioral therapy actually involve helping you face your trauma-related challenges by exposing you to places, things and situations that remind you of your trauma. Known as exposure therapy, this intervention gives you the opportunity to relive your traumatic experience with the support and guidance of a CBT therapist. With exposure therapy, there isn’t any real risk to your safety — you get the chance to relive specific aspects of your trauma so you can gradually become less sensitized to your trauma triggers. This can mean visiting the location of a violent car crash, looking at photos of a sexual abuser or watching a movie that contains imagery you associate with your trauma. 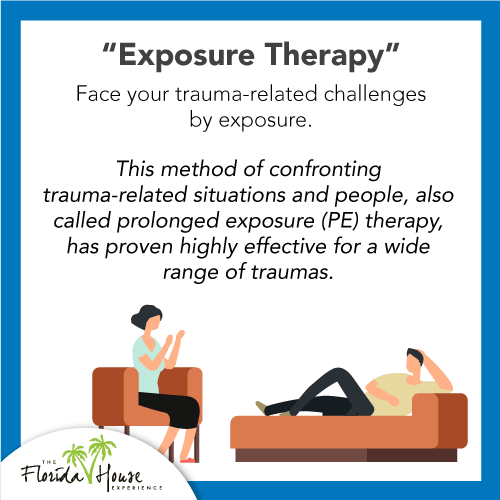 This method of confronting trauma-related situations and people, also called prolonged exposure (PE) therapy, has proven highly effective for a wide range of traumas. Because the symptoms of PTSD include depression, anxiety, insomnia and vivid nightmares, the FDA has approved just two drugs for use in the treatment of PTSD: Zoloft and Paxil. These selective serotonin reuptake inhibitors (SSRIs) have been shown to provide some symptom relief in approximately 60 percent of patients with PTSD who were prescribed the drugs, although fewer than 30 percent achieved complete remission of all their PTSD symptoms. One of the newest and most promising developments in PTSD treatments is the use of virtual reality or VR as a therapeutic tool. Dubbed virtual reality exposure therapy (VRET), this technique exposes patients to a computer-generated environment through a head-mounted display device that recreates specific situations related to their trauma. The experience is essentially a type of exposure therapy that enables the therapist to create a safe, controlled exposure within the safety of an office, clinic, or treatment center. At FHE, we combine cutting-edge biometric testing with proven neuro-psychological assessment methods to achieve a clear, personalized picture of every person we treat for PTSD. This gives our team of mental health and addiction experts the information we need to identify which parts of your brain have been adversely impacted by PTSD and any co-current substance abuse issues. Our eight-tier neuro-rehabilitative PTSD treatments are based on our integrated medical care approach to treating the whole patient. We understand that PTSD causes complex, measurable changes in the way your brain works, and we use advanced, non-invasive equipment to monitor the impact your treatments have on various biometric markers, including your brainwaves, heart rate and other measurable markers of your progress in therapy. And because we know many people living with PTSD also struggle with addiction to alcohol, prescription drugs, and illicit substances, our PTSD treatments include services to address any addiction issues you may have. If you need PTSD treatment or want more information about our PTSD programs, call us here at FHE Health — we’re available to talk 24 hours a day, 365 days a year. We offer a wide range of specialty programs for people suffering from the devastating impacts of PTSD, including our unique Shatterproof Program that’s exclusively for first responders who are dealing with addictions and mental health issues.